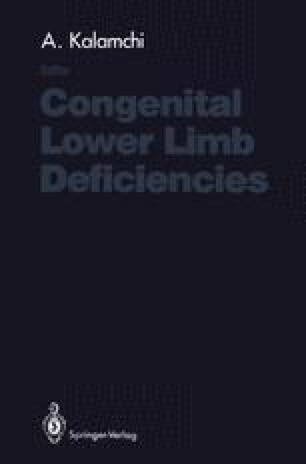 Evaluation of the developing lower limb—whether dealing with the multitude of skeletal dysplasias, the highly variable deficiency and duplication situations of congenital deformities, or the manifestations of acquired, traumatic, metabolic, or infectious problems—requires an adequate understanding of developmental chondro-osseous biology. The musculoskeletal and neurovascular components of the leg undergo not only basic differentiation processes, but also specific steps leading to the discrete morphology of the various regions. Major alterations in the initial differentiation will result in focal deficiencies such as absence of the proximal femur or tibial hemimelia. The considerable morphologic variation in these and other hemimelic disorders suggests variable susceptibility to the etiologic factors. Subsequent intrauterine conditions also may affect development, leading to disorders such as tibial pseudarthrosis or amputation from amniotic band syndrome.